Currier & Ives. 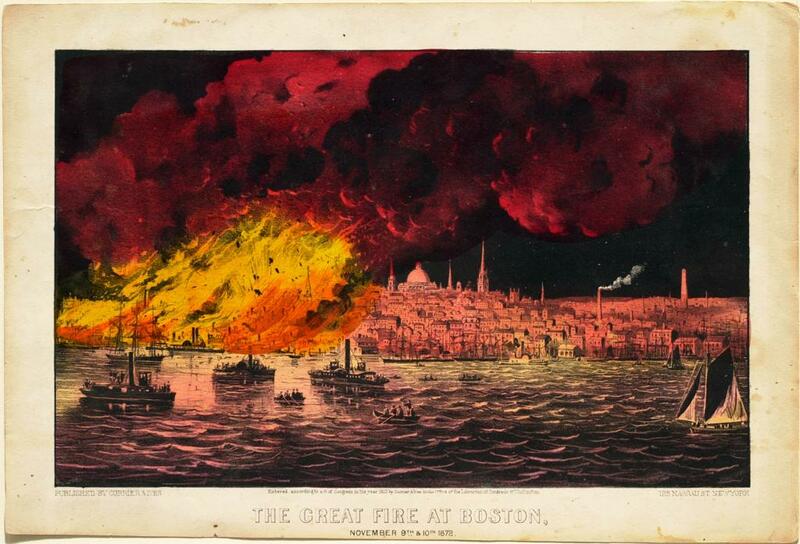 The Great Fire at Boston, Nov. 9 & 10, 1872. Lithograph on paper, 1872. Sterling and Francine Clark Art Institute, Williamstown, Mass. Facsimiles of artists' signatures can often be found in museum catalogs. Other locations of artists' signatures are Benezit's Dictionnaire (Reference N40 B4 1999; also available at the Clark & Willams via Oxford Art Online), the Dictionary of Art (Reference N31 D48), and books on monograms and signatures (Reference N45). In working with prints, the researcher needs to be able to identify not only the artist's signature but also, if the print was owned by an important collector, any mark that a collector may have added to the print. The definitive source for collectors' designations and print artists' signatures and marks is Lugt, below. Lugt, Frits. Les Marques de Collections de Dessins & d'Estampes : Marques Estampillées et Écrites de Collections Particulières et Publiques, Marques de Marchands, de Monteurs et d'Imprimeurs, Cachets de Vente d'Artistes Décédés, Marques de Graveurs Apposées après le Tirage des Planches, Timbres d'Édition, etc. : avec des notices historiques sur les collectionneurs, les collections, les ventes, les marchands et éditeurs, etc. The Hague: M. Nijhoff, 1956. This important resource reproduces identification marks placed on drawings and prints. Marks are grouped into the following categories: 1) names, inscriptions, and monograms; 2) figures; 3) marks difficult to decipher and Japanese marks; 4) numbers; and 5) specimens of writings. Includes extensive sales information and index to names of collectors, artists, dealers, and publishers.